11th National Tribal Crafts Mela Aadishilp has begun in New Delh. 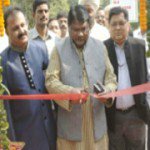 It was inaugurated by Union Minister of Tribal Affairs Jual Oram. This edition of Crafts Mela has been organised by Tribal Cooperative Marketing Development Federation of India Limited (TRIFED) and will be open till November 11, 2015. More than 90 tribal artisans from all over the country are going showcase their unique and exquisite tribal artefacts. The main objective of Aadishilp is provide tribal artisans an important platform to showcase their talents through their valuable products to urban India. Tribals will be also able to sell their traditional art and craft works directly to the customers and get their valuable feedback.